My friend Jon C. is starting a “Swords & Wizardry” game which will (hopefully) kick off shortly after I get back from St. Louis next week. Some members of our game group seem to doubt that ‘old and simplistic’ games can be any good or any fun, but I am really looking forward to it. Part of what I have been missing is the fun we had wondering, “what happens next?” back in the day and I miss games that put the players (and what they want to do) in the driver’s seat rather than the ‘story based’ games where elements are planned out beforehand or more complicated rule systems where players are rewarded with more options for gaming the character creation rules. It’s been a while. Thanks, Jon. The illustration above right is one I did for “The Barrowmaze.” And, yes, the fighter IS supposed to look like ‘Alley Oop.” Alley Oop is the shiznit. I'm certain that the detractors in your game group will be pleasantly surprised. Enjoy! 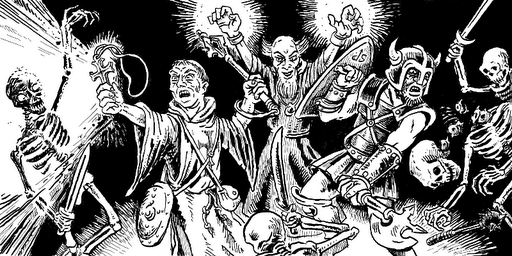 What were the odds that both the Cleric and the Fighter were going to be left handed? At first I thought it might be an image flip thing, but all the skeletons are right handed. I wish you were closer to Canton – I could start up a tabletop homegame for Castle Nicodemus. fantastic job on the barrowmaze art. it's a great module and I think you define the mood of that module perfectly.